Justin’s note: Today, I’m sharing a timely update from gold expert E.B. Tucker, editor of Strategic Investor. E.B. says gold is on the verge of a big rally… one that should send the metal 22% higher next year. Last Tuesday, the Dow plummeted nearly 800 points. On Friday, it fell another 559 points. Trump’s economic team assured the media that everything will be fine. But this lurching up and down disguises what’s really going on. The Dow is off nearly 10% since October 1. Popular tech stocks Apple and Netflix are down three times as much, at -27% and -30%, respectively. This is a bear market. Gold, on the other hand, finished the day up $8 on Tuesday. It finished the week up 2.4%. And I think it’s only going higher from here. In short, a new season is coming… one that should push gold 22% higher in 2019. Today, I’ll explain why gold is primed for a rally – and how to take advantage. 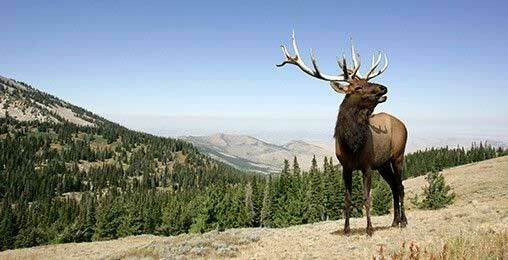 Utah and Idaho are two states that share a common border. And thanks to President Trump, this revival is already taking shape—unlike anything we’ve seen. Americans will be put to work… State funds will increase by millions and everyday investors could make a fortune. If the answer you get back is, “Absolutely not!” then you know to sell immediately because dogma has overpowered rational decision making. We’ve seen this all year with bitcoin investors, who believe nothing is wrong with the digital currency despite it crashing 70% this year. Gold passes the dogma test that bitcoin fails. I spent a day at the traditionally gold-focused New Orleans Investment Conference last month. From my vantage point, there were more exhibitors than conference attendees. This is telling. It’s our take that almost no professional money managers own gold. Most have considered a position in cryptocurrencies in the last year to appease clients. If you stick around long enough, you’ll notice these “professionals” are more comfortable following the pack than leading it. I’m on the board of a company that buys gold royalties. I can tell you firsthand that the state of the gold market is beyond dire. This is exactly the type of condition you see before a big rally unfolds. Is America on the Verge of Bringing Back a “Gold Standard”? The No. 1 indicator of a coming rally in the gold market is the gold-silver ratio. It measures the number of silver ounces it would take to buy one ounce of gold. The average reading for the gold-silver ratio back to 2002 is 64. Today, it sits at 85, a record high. Notice in the chart below the extreme highs in this ratio in 2003, 2009, and 2016… all of which signaled a major rally in gold and gold stocks within months. From 2004-2006, gold rose 85% after this ratio hit 80. From 2008-2011, gold rallied 171%. And in 2016, it rose another 28%. 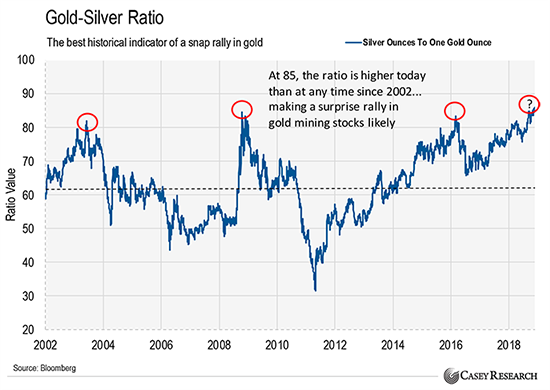 Gold stocks – as measured by the Philadelphia Stock Exchange Gold and Silver Index (XAU) – did even better… From 2004-2006, gold stocks rose 116%. They rose 256% from 2008-2011. And they jumped another 191% in 2016. Consider that for a minute. We’ve seen three very big moves in the price of gold in the 21st century. That’s one roughly every six years. We’re about due for the next one and it’s likely to be the biggest yet. In fact, I think gold could eventually go back to $1,900 – and beyond. But we’re not calling for that next year. Next year, I believe the price of gold will hit $1,500 an ounce. That’s a 22% increase. It will be one of the best-performing markets in a very volatile year for equities. We also recommend buying gold stocks for even more upside. Gold stocks are leveraged to the price of gold. This means when gold moves an inch, this sector can move a mile. These rallies are infrequent. They’re also large. Having a small, appropriately sized position that you can afford to hold onto is enough. Gold is gearing up for a 22% rally in 2019. Now is the time to take advantage. P.S. At Strategic Investor, my team and I focus on the world’s top money-making opportunities. We see that with gold today. 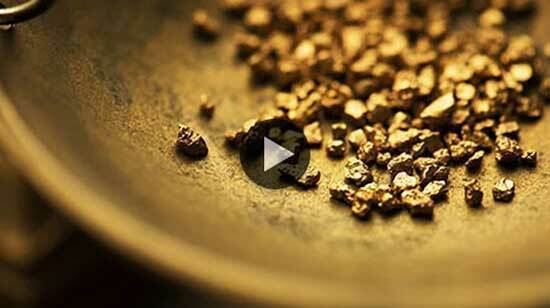 We’re speculating on some of the highest-potential gold stocks in the world. Many of these are names that you probably haven’t heard of before, but all of them have explosive upside from here. You can access these names, and all of my extensive research on the gold sector, with a subscription to Strategic Investor. But first… As I mentioned, we’re focused on the biggest ideas to help you multiply your money. And investing in gold stocks isn’t the only way to do that today. In fact, I just released a brand-new video that uncovers one of the most lucrative opportunities today. In short, thanks to a recent Supreme Court ruling, $4 billion is set to move out of the shadows and into three very specific stocks – on one day, February 4, 2019. Why that day? I explain everything you need to know right here. I think Doug is making two fundamental mis-assessments of the electric car future. I’d be interested to hear him address them. 1) We got spoiled by silicon. Moore’s Law worked for silicon because advances there involved miniaturization and small things in general. With cars and energy storage, there is vastly different physics at work. That’s why we’ve seen such slow progress on batteries for 100+ years. 2) Energy feedstock. It’s odd to read someone with Doug’s insight thinking fossil fuels won’t be relevant soon… the energy required to make all these cars and batteries will likely come from fossil fuels, which will retain their place as the most flexible, storable, transportable, and dense source of energy. There won’t be electric-powered rare earth mineral mining trucks, nor electric-powered car body manufacturing. The blessings of fossil fuels will be solidly behind any boom in electric cars. I wonder why the “powers that be” are directing us toward electric vehicles since they are not a complete solution to the current oil-based vehicles. They lack range and suffer from a dependence on some very scarce metals for the batteries. The range issue eliminates people that like “driving” to distance locations. The range today is something like 250 miles and then require a long downtime to recharge the batteries. Personally, I enjoy a 1,000-mile driving day. And yes, I am likely different than many other drivers. I understand that Tesla (via Mr. Musk) stated that batteries could be swapped in a short amount of time but not currently competitively with a gasoline or diesel vehicle. And then there is the issue of ownership of the original battery. I would propose a hydrogen-fueled vehicle. The fuel could be extracted from water. The fueling process time could be competitive with current refueling for gasoline and diesel. This would introduce some safety issues related to vehicles involved in crashes. It would seem that effort to mitigate the issue would be a better long path. And much more cost effective! My son-in-law just bought an electric car. He loves it, now he has two trunks for storage. I bought a Chevy Bolt EV a year ago. I also own a Corvette and Ford Escape SUV. My wife and I both drive the Bolt 99% of the time, winter and summer. We love it and have not had any problems with it. There are several free charging stations near us but it’s more convenient to charge in our garage and I can’t detect any big increase in my electric bill. Would I buy it again? Absolutely! EVs have a long way to go. Try driving on vacation from New Orleans to the Grand Canyon. There is no way your battery will get you there and you cannot stop at a station and get a replacement battery in order to continue your trip. For a vacation, EVs are useless. I believe that electric cars have too many side effects. Driving range, price. Too many problems. And insurance companies will still be making money selling insurance. Today, a substantial portion of the highway network maintenance is paid out of fuel taxes levied on gasoline and diesel fuels. The electric self-driving cars will not be paying that tax. In many jurisdictions, the non-gasoline powered vehicle pays a premium registration fee. With a significant reduction in vehicle numbers, the receipts from these fees will need to rise dramatically, which will further depress the vehicle numbers. How much of the present highway system will be done away with because of the reduced number of vehicles? Second question: How long before the general public will come to accept a truly driverless vehicle? I foresee a period when an attendant (read “driver”) will be required somewhat as a man on foot carrying a flag used to be required in front of a horseless carriage in some jurisdictions some time ago. Also, how long will it take for the public to accept the idea that an 80,000 pound gross tractor-trailer can safely cruise public highways without any sort of attendant? I am guessing that it will be at least a generation. How is the EV more economical when the electricity is seven times more expensive than the gasoline? The electrical system to homes cannot carry the load if most homes have car chargers. It will be very expensive to upgrade the residential distribution system. As always, if you have any questions or suggestions for the Dispatch, send them to us at [email protected]. This “new gold” investment has delivered gains of 169%, 264%, and 9,001% over the past year… And there’s still massive upside ahead. 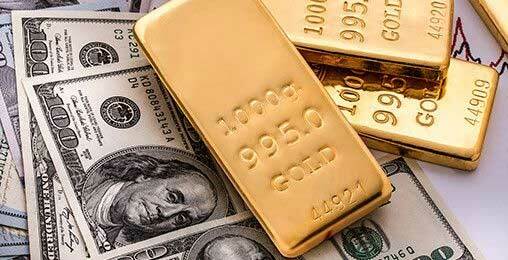 It’s a revolutionary way to make big money from gold – even if the spot price falls. This is required reading for every Dispatch subscriber. Go here.